Have you joined the milk tea bandwagon? You're not alone. 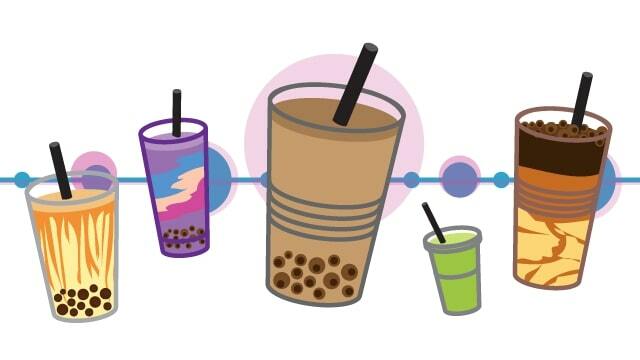 It's 2019, 11 years after the popular milk tea arrived on our shores, and love for milk tea is at an all-time high. The sheer number of milk tea fans keep growing as milk tea shops keep popping up with their extensive menus that ensure that anyone can find their exact, perfect cup. Nowadays, it's not surprising to see someone you know drinking milk tea at least once a week, lining up for hours, or having it delivered to their doorstep. Although we don't have an extremely rich history with tea like in China, Filipinos have always had a taste for tea. 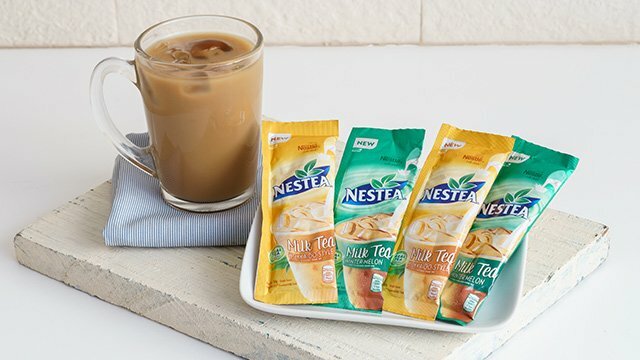 Nestea Iced Tea and Lipton Iced Tea are household and restaurant staples, C2 went extremely big back in the day, and most of us brew our own salabat or ginger tea. In fact, milk tea has always been there even before the craze. Chow King has always been selling Nai Cha, traditional Hong Kong milk tea made with black tea and evaporated milk sans pearls. So what exactly caused the sudden spike in fame? Milk tea has come along way. It was December 9, 2008, when Serenitea opened its first branch in San Juan, Manila. If you need to blame someone for your milk tea addiction, it has to be Serenitea founders Juliet D. Herrera-Chen and Peter L. Chen. Peter, who spent some time in Taiwan, where milk tea was already trending full-swing, thought that us Filipinos were going to want in on it, too. He was right. 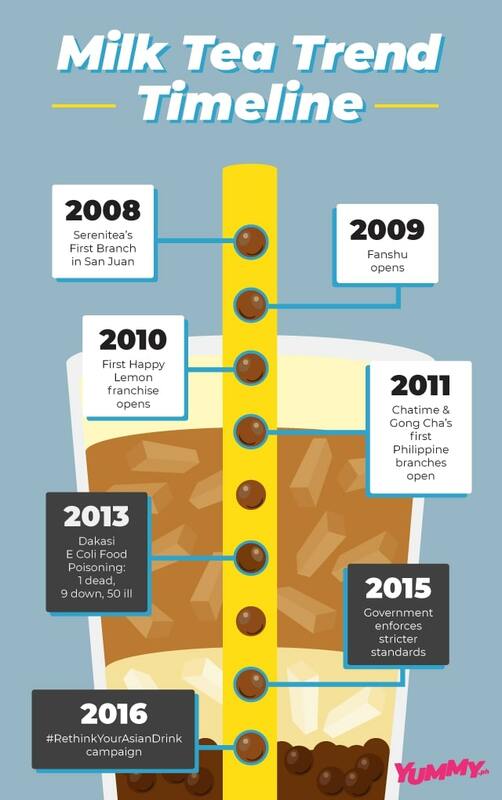 By 2009, Serenitea's shops had already been doing well and other entrepreneurs soon caught on. Happy Fanshu, in 2009, opened near Far Eastern University, bringing milk tea to droves of students. This was only the beginning. Milk tea shops then began to populate near Ateneo, La Salle, and UP with their quirky milk tea puns: Teaology, Infinitea, Q-Tea, and more. This was the true start of the explosion. Milk tea shops began to compete with coffee shops. Milk tea shops, after all, carried a similar ambiance, a casual space that allowed visitors to stay for long periods of timeâperfect for the student with a paper to finish or friends to hang out with. 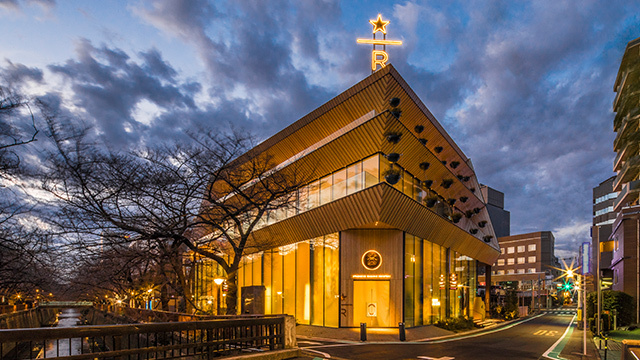 The massive number of students getting in on the trend, buying milk tea as both a caffeinated pick-me-up and a sweet treat, allowed these milk tea shops to thrive. On top of that, milk tea had the edge of being ânovelâ and also being branded as a healthier" drink. Milk tea was on a roll. It reached new heights when Chris Tiu, who was then the UAAP basketball player who heralded Ateneo's 5-peat winning streak, bought a franchise of Happy Lemon straight from Taiwan. People went crazy for Happy Lemonâs cream cheese and they formed shocking long lines. With the milk tea trend well into the mainstream, everyone began to have their favorites. When SPOT.ph released its first Top 10 Milk Tea Spots In The City, it meant that the market had reached a big enough number of milk tea shops to actually rank the players. Granted, most of this nearly decade-old list have closed down since. It seemed that Chris Tiu, with his Happy Lemon Franchise, had set the precedent. With milk tea competitions running high, milk tea franchises from the mothership of milk tea, Taiwan, entered our market. Gong Cha and Chatime not only entered the market, but they soon climbed the lists, encouraging other milk tea shops to keep up. Taiwanese milk tea shops weren't just taking over our country at this time, but they were also moving into the rest of the world. Aside from wanting to tap a bigger market, there was another sinister reason for the international milk tea trend. In that same year, the milk tea trend suffered a setback in Taiwan as tainted additives were discovered. Growing on new soil, milk tea continued to prosper. The trouble though also began in 2013. Just as the milk tea trend had reached its high plateau, the descent was inevitably coming. In that year, a branch of Dakasi in Iloilo served milk tea contaminated with E. Coli and Salmonella causing 50 customers to fall ill, one of them died. Milk tea, when it exploded into our shores, was branded as a healthier substitute for coffee. But in 2016, a study was held to examine just how much sugar milk tea drinkers were getting. They were getting A LOT. In their study, they found that Asian Americans in Southeast Asian communities (which includes the Filipino community) were not only prone to bingeing on milk tea but that they were also prone to diabetes. However, locally, it didnât seem that people cared for milk tea as a health drink. With the passage of time, new milk tea products and the arrival of new milk tea shops straight from Taiwan meant one thing: the milk tea trend was officially back. Milk tea shops Macao Imperial, Yi Fang Taiwan Fruit Tea, popular milk tea names in Taiwan, all opened up shop locally in 2017. Thai brand Cha Tuk Chak came in with their distinctly flavored Thai milk tea. The combined marketing efforts of these new players captured the nostalgic yuppie and the millennial market. The generation of college students who spent a chunk of their allowances on milk tea now had jobs and money to spend, spend, spend. Two favorites collide with this partnership. Other iterations of milk tea appeared on the scene, too. 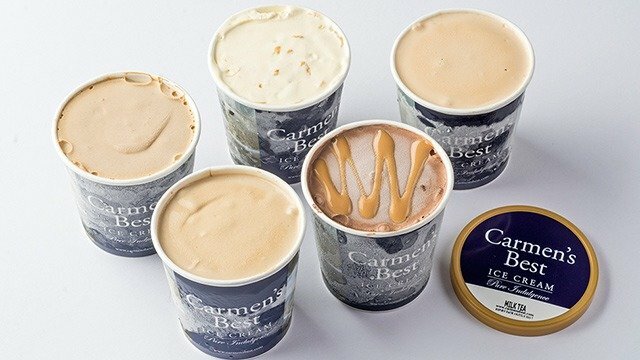 Carmen's Best released the first Milk Tea Ice Cream. For its anniversary, milk tea shop Moonleaf Maginhawa released spiked milk tea drinks. You can get milk tea brewed in vodka from Milk Tea at Default: Cafe Pub. It's milk tea for less than P 20! The milk tea craze surpassed stallsâpeople wanted to have it at home, too. It became even more accessible as Nestea and Lipton released sachets of milk tea powder. It's a milk tea fix that was super affordable. Not long after, Taro Milk Tea came booming in as Nestea also released an uncanny sweet drink. With a healthy, competitive market for milk tea, more innovations and viral trends came up in 2018. From Macao Imperial's adorable Kitten Milk Tea to Ho Chaâs Galaxy Milk Teas coming in arrays of ombres and gradients, milk tea was more than just for your palate; it was also for your eyes. Consumers were milking their money's worth with money shots for their Instagram. Milk tea was more than a craving, it was, like a Starbucks coffee cup, a status symbol, something you'd do for the gram. Last year, people went crazy for CoCo Fresh Tea. It garnered so much hype that you had to spend 30 minutes to an hour lining up. They werenât just capitalizing on milk tea, they were also hyping up the freshness of their tea, but also, they were also selling white pearl (sago). Serenitea partnered with Holly's Milk for this delicious series. Serenitea released a brown sugar milk tea series that latched on the Filipino's love for Taho while also partnering with Holly's Milk. The trend went viral and it was sold out the first day. 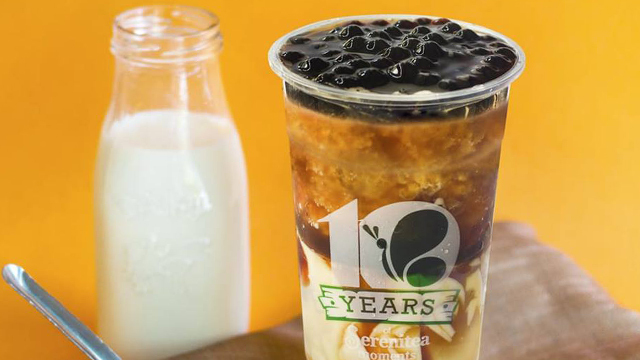 Serenitea may have started it, but the brown sugar milk tea trend was only just beginning. Tiger Sugar, a Taiwanese milk tea franchise known for the brown sugar syrup stripes on the cup, opened up shop in Bonifacio Global City, Taguig. A peculiar milk trend also took place that wasnât focused on flavor or aesthetics, but sheer bulk. Milk tea gluttony was an actual trend. Serenitea began the trend in 2016. They seasonally release their 1-liter jumbo cups every December which coincide with Christmas and their anniversary. By 2018, other brands had picked up and sold in bulk. 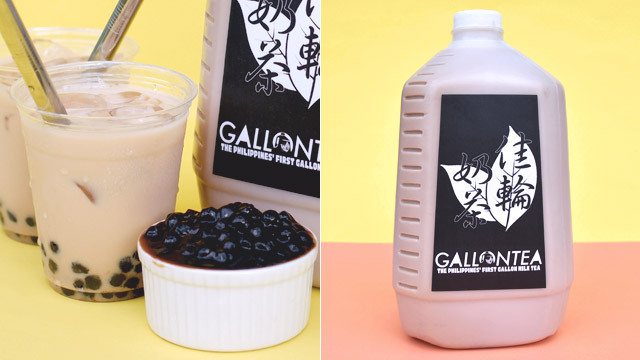 Notably, Kowloon began selling 1-liter milk tea for less than P100 and Gallontea, you guessed it, sells milk tea by the gallon. If you can't beat them, join them. Starbucks finally joined the bandwagon with its own milk tea series with milk tea Frappuccinos. 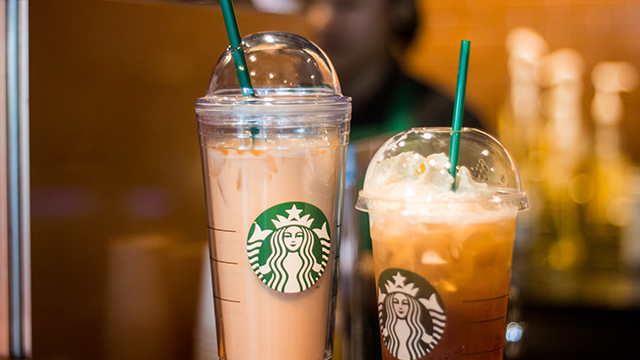 If you want actual milk tea in Starbucks without coffee, though, you might want to do this hack instead. This 2019, milk tea shops have capitalized in the urgency of our cravings by putting their drinks on wheels. You can now order milk tea from GrabFood, Honestbee, and FoodPanda. Currently, there's a meme going around about how much money we've been putting into milk tea. The accumulated costs, we must admit reaches a staggering amount by the end of a year. The milk tea trend has come such a long way, but itâs still here, and we think, it's here to stay. We don't just love milk tea, we're addicted. Today, we don't think milk tea can still be classified as a trend. Rather, milk tea has become a staple.